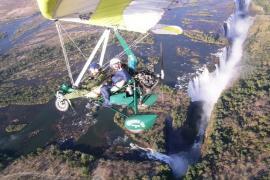 would also deal with her fear head-on as she signed up for microlighting in addition to the rafting. This morning we were given the briefing before we headed out. I needed to pay full attention as I had never done this before. was sure there was no way I was going to stay in. But two of our girls fell out. They were rescued and brought back to us. to hear to know that I was not getting thrown into the river even if it took every muscle in my body to hang onto the raft. As each rapid came, we were briefed on how to handle it and given instructions of how to get through it. We were doing great. Sadly, it was too late as we were already in the middle of the river. Crap. We did what we needed to do and came out on top. caught underneath rocks on the side and was sure he was a goner. 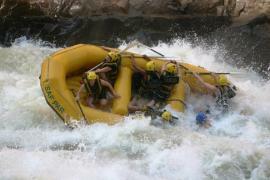 that they don’t inflict the same amount of fear that the rapids here did. Well, that was a bit reassuring. was no solid ground beneath, we still had to use the ladder horizontally. We looked like monkeys. Wet, tired monkeys. (possibly a million) before it will actually constitute ‘Victoria Falls’. me the hippos and crocodiles. The ride was over shortly after and I could not stop telling Bernie how amazing that just was. Class 5 rapids? No problem! Okay...a bit of a problem.